The "Muk" is a 20,000 square foot skate park with a concrete bowl and flow design. 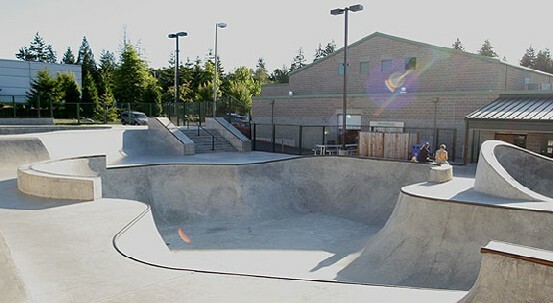 The park features an upper keyhole shaped bowl upto ten feet deep with steel coping. The lower bowl features pockets and hips and is from 4' to 10' deep. Around the bowls is the steeet course featuring stairs, rails, ledges, quarterpipes, fun boxes and more. The park is supervised and requires helmets and pads. Pads are optional if you're over 18.